Stadio Atleti Azzurri d’Italia officially opened on 23 December 1928 with a match between Atalanta and Triestina. 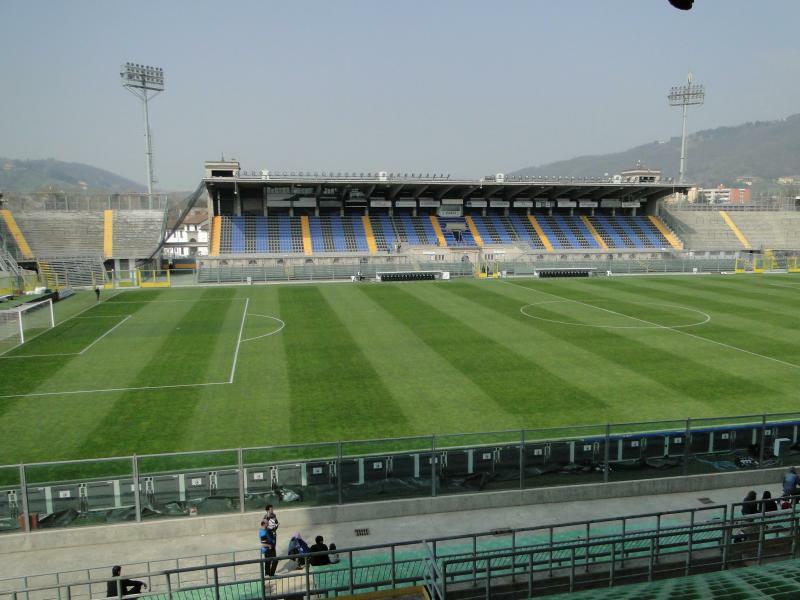 It originally went by the name of Stadio Mario Brumana and could hold 12,000 spectators. Over the years, Stadio Atleti Azzurri d’Italia got gradually expanded with the addition of both curves and a roof over the main stand. The stadium initially had a running track circling the pitch, but makeshift stands have been placed over it. The stadium has also been the home of AlbinoLeffe since they promoted to Serie B in 2003 and their traditional home in nearby Albino could not meet league standards. They have kept playing at the stadium despite relegating again in 2012. Stadio Atleti Azzurri d’Italia has aged significantly over the years and lacks the many comforts of modern stadiums. In the last decade, Atalanta have therefore investigated several options to build a new modern home. Initially they focused on building an entirely new stadium on the outskirts of the city, however these never materialised in anything concrete. In 2017, Atalanta bought Stadio Atleti Azzurri d’Italia from the city of Bergamo and are now planning to extensively redevelop the stadium. The plans include building two new covered curves and refurbish the other stands, resulting in a capacity of 24,000 seats. They hope to complete works in 2020. Stadio Atleti Azzurri d’Italia is located north-west of central Bergamo, about 2 kilometres from Bergamo’s old town (up the hill), and about the same from Bergamo’s more modern central areas down the hill. It is slightly more than 2 kilometres from Bergamo’s rail station, which has frequent train service to and from Milan. The walk form both the old and new town, as well as the rail station, takes no more than 30 minutes. Alternatively, you can catch bus 6 (direction S. Colombane) or 9 (direction Bruntino –Sorisole) from the rail station (Porta Nueva), and bus 3 from the old town (direction Ostello). Stadio Atleti Azzurri d’Italia is located in a quiet residential neighbourhood. There are a few local neighbourhood bars en restaurants around, but there are many more options for eating and drinking in Bergamo’s picturesque old town and the new town near the railway station. There are no large hotels near Stadio Atleti Azzurri d’Italia, but plenty of smaller B&Bs if you wish to stay very close. However, most will decide to stay in central Bergamo and make the pleasant walk to the stadium. Click here for an overview of hotels in Bergamo. Tickets for Atalanta games can be bought online via Listicket, at the club store at the Via Tiraboschi 89 in Bergamo’s modern centre, or at any of the Listicket sales points. Tickets can also be bought on the gate from about three hours before the start of the match. Atalanta rarely sell out. Ticket prices can depend on the opponent, but typically range from €13.00 for a seat at one of the curves to €100.00 for a central seat at the main stand. Tickets for the opposite side tend to go for between €18.00 and €23.00. Email biglietteria@atalanta.it for more information. AlbinoLeffe tickets can be bought online through Vivaticket, through any of the Vivaticket sales points, or before the match at the stadium. Expect to pay between €14.00 for a ticket at the curve to €20.00 for the better seats at the main stand. Email biglietteria@albinoleffe.com for more information. Atalanta.it – Official website of Atalanta Bergamasca Calcio. Albinoleffe.com – Official website of UC AlbionLeffe. Visit.bergamo.com – Official portal for Bergamo tourism. Atb.bergamo.it – Bergamo public transport information. – Buying through Listicket was not possible as they required a club membership number. – The Credito Bergamasco branch closest to the stadium did not sell tickets, but the one near the railway station did. – The ticket windows of the stadium also seemed to be selling tickets before the start of the match. – Despite the website of Atalanta recommending parking at the cemetery south of the stadium (app. 2 km away), there seemed to sufficient parking closer to the stadium. – The covered stand opposite the main stand seemed to be best value for money.